Exploring Ion, that fancy mall along Orchard Road, yielded pleasant surprises. The Food Hall at its basement offered a selection of Japanese food stalls. Pad, who joined me for the second half of the trip, is a major tonkatsu fan. 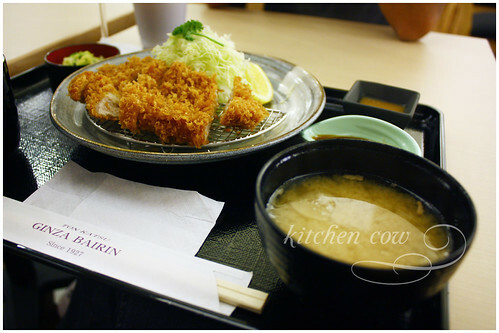 So, eating at Ginza Bairin, a big Japanese chain that specializes in tonkatsu, was essential. Established in 1927, Ginza Bairin takes pride in using the choicest pork loins for an outstanding flavor, aroma and texture. Sure enough, the pork was more tender than most tonkatsu, and the sauce was better than your usual bottled tonkatsu sauce. While I had the standard tonkatsu set, served with rice and a flavorful pork and konnyaku soup, Pad opted for the Curry Katsu set. Smartly enough, they keep the katsu away from the sauce, so it doesn’t get soggy, allowing the diners to do this themselves. All in, it was a pleasant meal, but I’m not quite sure whether it was worth the price. It was pretty pricey, for a simple tonkatsu meal—probably due to the aforementioned “choicest ingredients.” Or perhaps my perception has been spoiled majorly by all the delightful meals I’ve had, for below 5 SGD at the hawker centers? Not that I regret eating there. I just probably won’t do it again, unless somebody else is paying. Or so, the signboard at Sand Bar, a little kiosk along the Sentosa beach advertises. We were looking for cheap eats plus a place to sit, so we decided to grab their paired hotdogs. Despite the claim, we weren’t expecting much, so when these super yummy hotdogs came out, I was floored. 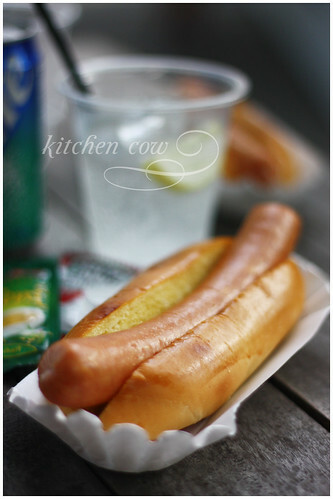 These thick hotdogs were so juicy and flavorful, packed in a crisp casing and a really soft, toasted, buttered bun. After taking a single bite, I easily agreed. This was among the best hotdog sandwiches I’ve eaten. 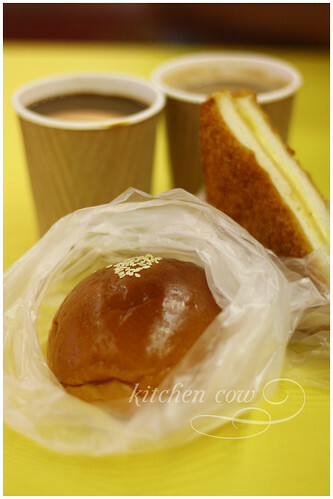 Time sure flies and unfortunately, I wasn’t able to visit a decent kopitiam during my stay! I made sure to grab some at the airport, but sadly, it wasn’t as good as the ones I’ve tried before. We snacked on some bread and sandwiches we brought from Takashimaya’s basement—the bread store’s name escapes me, but it was a Japanese brand and was set-up like Bread Talk. 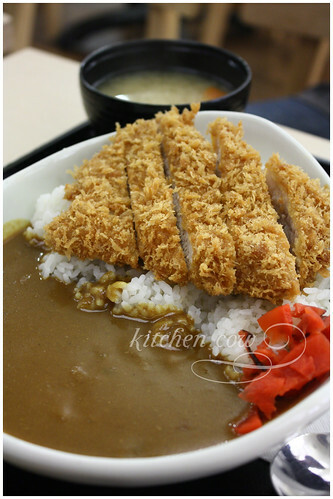 Read more on the concluding post, part 2 of 2.
katsu curry! I miss you so. I always wonder how they could make tonkatsu so crispy and crubly, my tonkatsu usually ends up like something that has a smooth bread shell. Do I need to cover the whole pork with the egg mixture or just dab it? I always end up with a soggy coating of panko before I fry the pork. Do you flour the pork first? It’s nice hearing your views on your favorite foods in Singapore are. 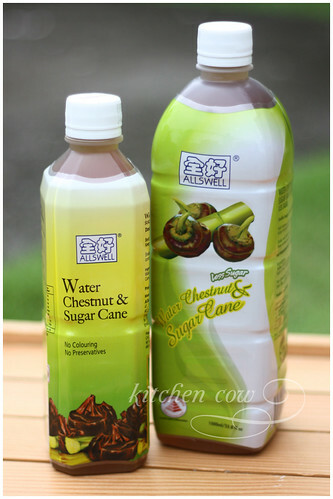 I am currently based here and have my own favorites but this post might just tempt me to get out and visit one of those places you mentioned… and I just might grab a bottle of the chestnut juice when I get home later. Tiong Bahru and Maxwell are my favourite Hawker Centers as well. Great stuff! I will try the stalls you mention in my next trips! I’m glad you approve! What do you like eating there? Singapore is a wonderful place for food. You can have all sorts of food in Singapore, and indeed some of the best are found in the hawker centers. the dishes that you have highlighted happen to be my favorites as well!